We started out by going to a beautiful stationary shop called Bomo-Art. They have two shops open in Budapest and we visited the one located on the Buda side. Bomo Art mainly carries their in-house, handmade notebooks, calendars and other stationary items, but they also focus on brands that are not predominantly known or carried by other vendors in Hungary. These include J. Herbin, Kaweco, KWZ, Robert Oster and Kyo no Oto inks. During our visit the owner of Bomo Art talked about the history of the company, his experience with fountain pens and inks and was kind enough to also listen to our suggestions or rather wishes on what products should they focus on for fountain pen enthusiasts. At the end they even prepared a farewell gift package for us that included a Bomo Art calendar and notepad. Thank you very much Bomo Art! ❤ If you guys are ever in Budapest and have time, I can definitely recommend that you check out one of their stores! After this we went over the Pest side to Magvető Café where the big fun started. Daniel already had tables reserved for the event so everybody quickly sat down and we started unpacking our pens and inks. 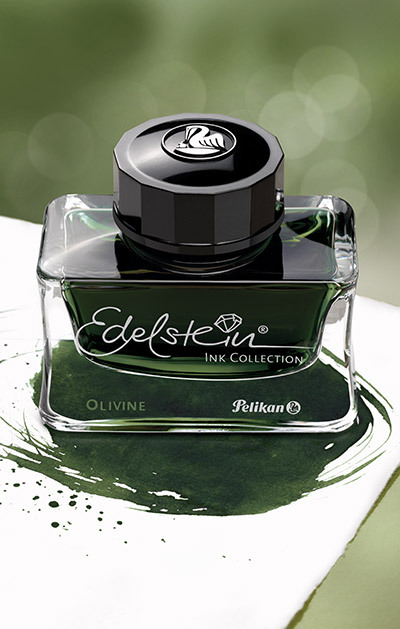 😁 We promptly got stopped because Pelikan prepared for us a presentation about the hub, an awesome flag which we all have signed and a packet of goodies, that included a bottle of Edelstein Olivine ink for everybody who has registered for the hub. Our hub master was also kind enough to prepare for us a neat little package with different kinds of paper that we could try out! What’s also awesome about Budapest is that the guys from the hub are also organizing monthly gatherings so I can attend those as well and finally talk about pens in real life with others! I can’t wait to get to the October pen meet. If you haven’t been to a Pelikan hub I can recommend it with all my heart! It was an awesome event with awesome people and many, many pens and inks! I won’t hold you up longer though, here’s the gallery with the photos the others made (thanks again guys for letting me post them! ).